"This has been a Thanksgiving favorite of ours for many years because it is different from the many mashed sweet potatoes recipes." Place sweet potatoes in a large saucepan with enough water to cover. Bring to a boil. Cook 15 minutes, or until tender but firm. Drain, and set aside. In a large skillet over low heat, melt the butter. Stir in the brown sugar, brandy, and salt. Add the sweet potatoes, and stir to coat. Cook, stirring gently, until sweet potatoes are heated through and well glazed. 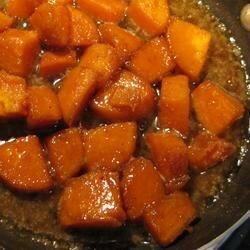 This recipe has been updated to include a step for boiling the sweet potatoes, as per the original submission. eh. Just okay. Not bad by any means but not as special as I thought they would be. Nobody at the Thanksgiving table seemed to even notice the brandy.